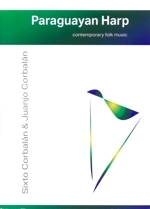 A Collection of five contemporary Paraguayan folk tunes by Sixto Corbalán & Juanjo Corbalán suitable for all types of harp. Sixto Corbalán honors the musical legacy for this 36 strings and keeping in mind his traditions he presents contemporary paraguayan music which reflects the global world we are living in. 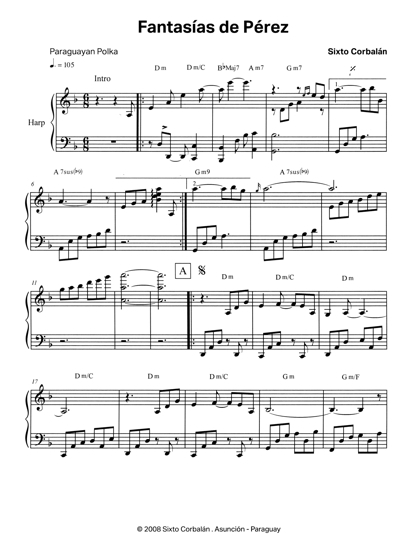 As interpreter as well as composer he owns several awards. Juanjo Corbalán is on constant research to innovate and integrate fresh arrangements for music on paraguayan harp and has developed a very personal style gaining several awards. Since 2007, Sixto and his brother, Juanjo, have performed as the harp duo Hermanos Corbalán This is unsusual in Paraguay, but as each is an exquisite soloist, the duo is now extremely popular and in demand throughout Paraguay and abroad. Both brothers have a special focus on new compositions for the Paraguayan harp, mixing their creations with different elements of other genres, innovating giving them great musical versatility with traditional and exciting new repertoire.